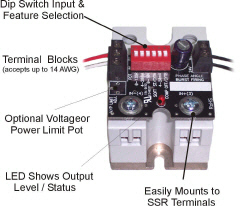 The SSRMAN-1B mounts directly on the input terminals of an SSR and converts it into a low cost power controller. Using the SSRMAN-1B with the appropriate Solid State Relay for your load will provide a modular feature packed high isolation power control at a very low price. The SSRMAN-1B's output power is a time proportioned relative to the command input which can be selected from eight different industry standard inputs. User configurable features such as Power Limit make the SSRMAN-1B a perfect fit heater control. Power Limit is set via a potentiometer and will limit the power on your load by limiting the duty cycle allowed on the output. 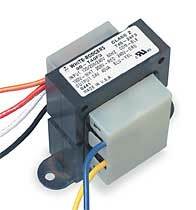 The SSRMAN-1B can be used with random fire or zero cross fired solid state relays.